Year: 1964. Running time: 96 minutes. Black and white. Directed by Masahiro Shinoda. Starring Ryo Ikebe and Mariko Kago. Cinematogrpahy by Masao Kosugi. Musical score by Toru Takemitsu. Aspect ratio: 2.35:1. Japan. In Japanese with optional English subtitles. DVD release by Home Vision Entertainment. Much like their French counterparts, the "new wave" films that came out of the Japanese studio system (Shochiku being the main one) in the 1960s were bold, provocative, and fresh. Seemingly free from the constraints of commercial obligations, directors such as Nagisa Oshima (Cruel Story of Youth, 1960, The Sun's Burial, 1960, and later the notorious In the Realm of the Senses, 1976), Yoshishige Yoshida (The Affair, 1967), and Pale Flower's (1964) Masahiro Shinoda all made names for themselves working for Shochiku. But the price for creative freedom was not as unfettered as initially believed. Pale Flower was actually shelved for months after co-screenwriter Masaru Baba branded Shinoda himself as an "anarchist" and deemed the film nihilistic and too concerned with visuals over story. Shinoda eventually managed to convince the studio to release his film, but the damage had already been done. Shinoda, along with other artists working for the studio during this time, would eventually leave Shochiku for good. Although patience is required from the viewer to thoroughly enjoy the many pleasures that Pale Flower offers -- in the wake of Seijun Suzuki's delirious yakuza spectacles Tokyo Drifter (1966) and Branded to Kill (1967), Kinji Fukasaku's numerous hard-boiled yakuza films, such as the Fight Without Honor series (1973-76) and the shocking Death of Honor (1976), and Takashi Miike's modern takes on the genre, Dead or Alive (1999) and Ichi the Killer (2001), among others -- Shinoda's idiosyncratic film comes across as downright mannered and demure. However, it would be wrong and, more importantly, reckless to underestimate the strangeness of Shinoda's breathtaking film. At times, the film plays more like a Japanese adaptation of a David Goodis novel on a low-grade hallucinogen than a simple crime tale. Ostensibly, Pale Flower is about a man in search of his soul. The man, a violent yakuza punk named Muraki (expertly played by Ryo Ikebe), has just been released from prison after serving five years for killing a rival gangster. Upon his release, Muraki returns to his life of gambling and criminal exploits. But he quickly realizes that his life of brutality is meaningless once he meets a young woman named Saeko (Mariko Kaga) at one of the gambling dens. Unfortunately for Muraki's sake, Saeko doesn't offer salvation, only oblivion. She too feels the downward spiral of modern life, the horrible malaise that awaits the awakened one. Whether it's careening through the Tokyo streets at night in Saeko's sports car, gambling away huge sums of money at once, or watching Saeko shoot up drugs, Muraki is unable to free himself from either his obsession with her or the nightmarish ennui that swirls larger within him with each passing day. He soon learns that sometimes, not even oblivion can save you. Although the story is occasionally grim and lurid, Pale Flower is also playful and stylistically imaginative. To emphasize the philosophical undercurrents of the story, Shinoda pushes the film into outright surrealism and also counterbalances many of the film's naturalistic moments (e.g. scenes at the horse races or within the smoky gambling dens) with scenes charged with symbolism and theatricality (e.g. Muraki's lover living in a house filled with ticking clocks). 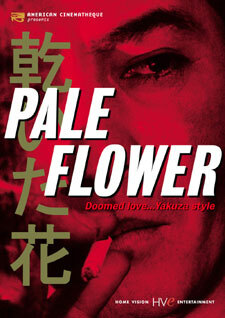 Pale Flower went on to usher in a whole wave of yakuza films, but its sensitivity for character and its skillful examination of hopeless men and women looking for meaning in an increasingly inhumane world separate it from its more genre-bound cinematic brethren. Home Vision Entertainment's DVD offers up a gorgeous widescreen black-and-white transfer. The disc also contains a video interview with director Masahiro Shinoda and liner notes by Japanese film enthusiast and American Cinematheque programmer Chris D.
Pale Flower is now available on DVD from Home Vision Entertainment in a new digital transfer that has been enhanced for 16x9 televisions. Special features: interview with director Masahiro Shinoda, director filmography, and liner notes by American Cinematheque programmer Chris D. Suggested retail price: $29.95. For more information, check out the Home Vision Entertainment Web site.